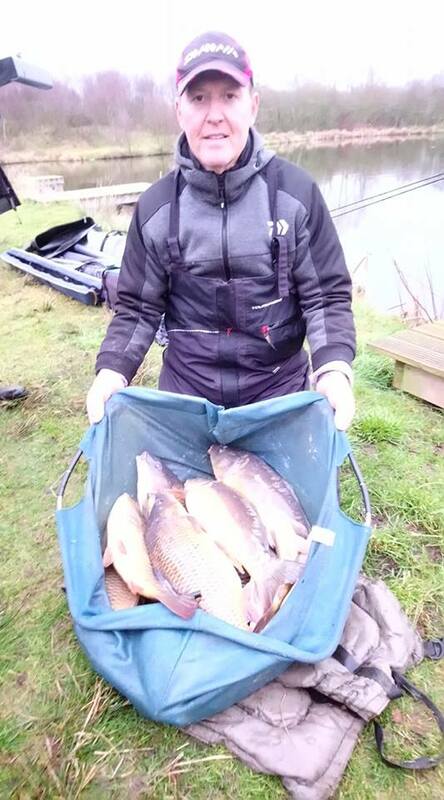 2nd – Steve Royle – 28lb 2oz (p21). 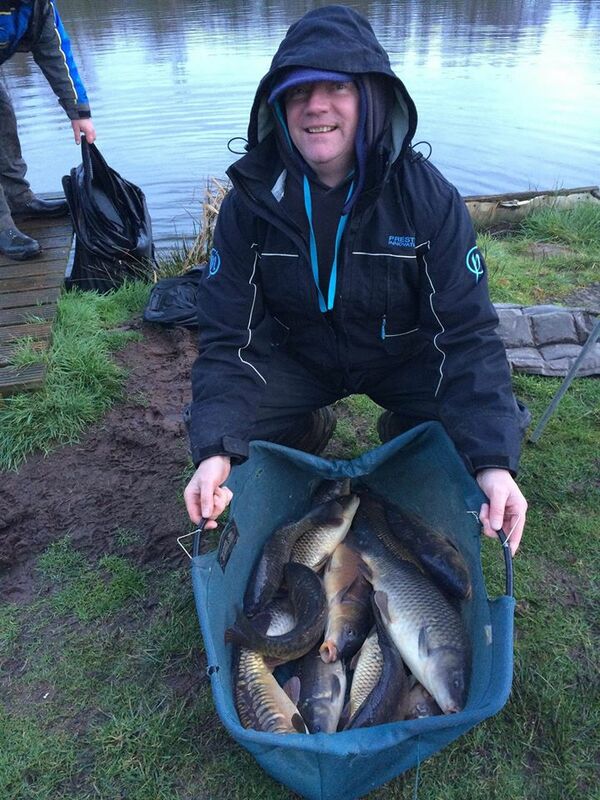 1st – Jim Anderson – 23lb 4oz (p25). With 50 mph winds forecast and showers… A few brave souls still turned out to fish the match… And fortunately, the forecast didn’t quite appear. With no rain and winds up to 20 mph with a few stronger gusts. With the ponds frozen solid for two days midweek and heavy rain yesterday… There was a bit of uncertainty as to how it would fish. Queensberry Water however fished reasonably well, but Bruce’s Acre proved to be very tough and didn’t produce the weights we’d expected after last week’s big net of carp.!! 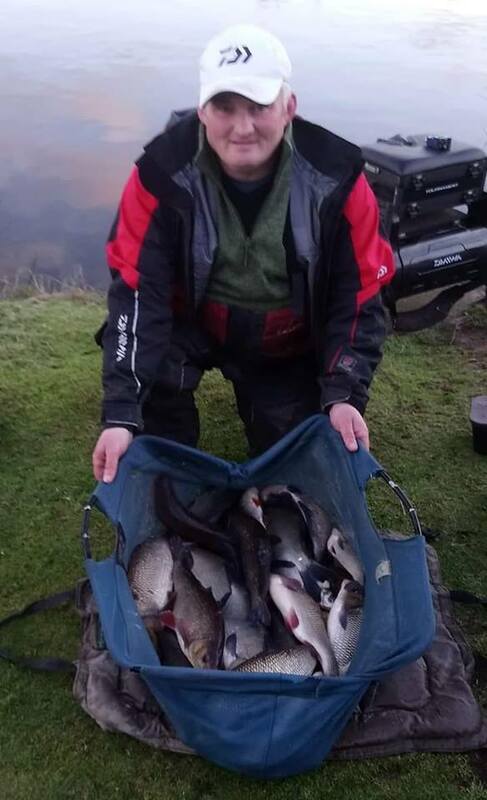 Today on Queensberry Water Barry Youngs drawing arm didn’t let him down when he pulled out end peg 19… One of the more sheltered pegs.! 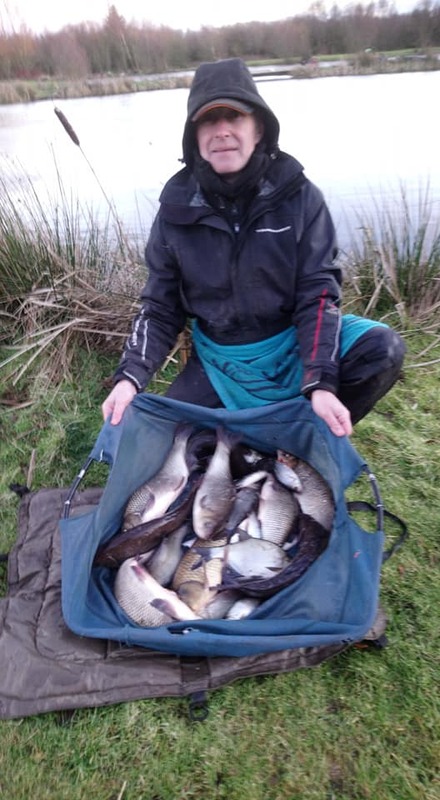 He fished a 13m pole line for most of the match with maggots… Catching 7 F1 carp, a small common carp, 8 big ide and 17 skimmers from 6oz to 3lbs… And at the weigh in put a fantastic 58lbs 8oz on the scales to win the section and Overall match. Steve Royle had 28lbs of silvers, with Eddie Bibby weighing in a mixed net of fish for 27lbs. 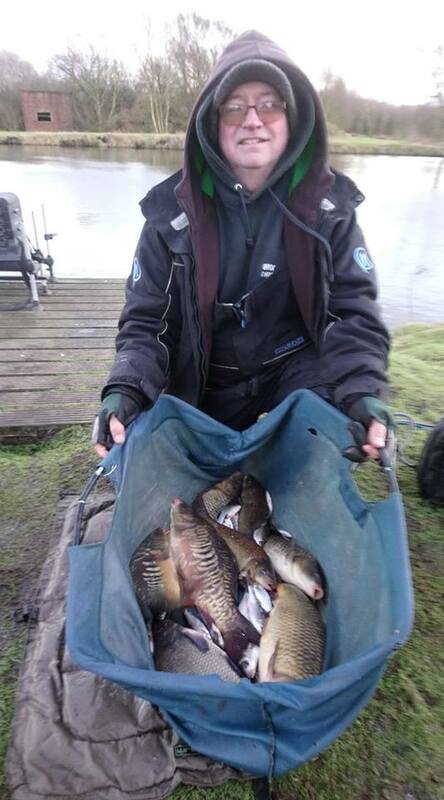 Queensberry Water section 2 was a little tougher with the wind, and Jim Anderson got his tactics spot on in a tough section today, opting to fish bomb and bread, Jim caught a few nice carp to win the section with 23lbs 4oz, with Ian Whitson finishing 2nd with a net of silvers for 17lb 8oz. Bruce’s Acre was a completely different Water today… With fish and bites very hard to come by. Don Lines picked a rough day weather-wise to pull out hot culvert peg 13… But he stuck to the task of catching a few carp and a handful of small silvers to win the section with 21lbs 8oz. Craig Duncan only needed 12oz to secure 2nd place to give you all an idea of how hard it fished… But we all know how much things and the pegs vary from week to week… It wouldn’t be fun if it was predictable.